We are approaching the Solstice, and the garden is in good shape—thanks to many helping hands, timely rains, and 16½ hours of daylight. After a long week for both of us, it was wonderful to be reunited with Courtney Friday night, cutting flowers and catching up. One week down, six to go. We are looking forward to seeing many of you here next weekend for our potluck! It had been a couple years, so it was especially delicious to have a nice crop of strawberries this Spring. If the rains keep up, we should have a few more through the Summer. We have picked a few handfuls of raspberries. The plants are vigorously growing now, so next year’s crop is looking good. We believe wholeheartedly in garlic, and this crop is shaping up nicely. We purchased the seed in 2006 and have been saving our own since. The two varieties are “German Stiffneck,” which has 5 or 6 larger cloves and “Spanish Roja,” which has more numerous (and slightly more pungent) and smaller cloves. The weakest plants are thinned out in early Spring as green garlic, and the seedhead and stalk—the scape—pops up a month or so before the bulb is ready. No one ever eats the best garlic we grow, because it is saved for seed and replanted in October. We still have quite a bit of garlic powder for sale. As the heat gets cranked up, the Spring peas and greens quickly head for the hills, except for Swiss Chard, which reigns over the Summer months. Rushing to fill the void of the cool-weather garden are the squashes, cucumbers, beans and tomatoes of the world. Beets, green onions and carrots are sizing up, while parsley and basil are starting to hit their stride. Eggs are bountiful right now. Give us a couple days notice, and we will have a dozen waiting for you with your share. They are $4. With all the changes taking place and on the horizon, we are very grateful for all of your well wishes and encouragement. You are a nourishing community to which we belong. We know for certain we have reached the end of an era, and many things are unclear about the future. But our love and commitment to this place, these people, this process is not unclear. It is rewarding to share the fruits of our efforts with you, and we are thankful for all the people who share our pains and triumphs through the cycles and variations of the seasons. The spring of 2010, like the past five springs, has been full of the activity of a farm waking up from winter. Many of you have read on our “Farmer’s Blog” and in our early newsletters about the seeding, tilling, planting, weeding, and first harvest of young plants, and the growth of a new batch of chicks. Beneath this season’s busy-ness, however, several new endeavors have been brewing, and we want to share them with you. First and most exciting, we learned in March that we are expecting our first child at the end of this season, in mid-November! The first trimester, with its extra hunger, sleepiness, and a little extra worry, ended with hearing our little one’s heart beating strong and steady. What a gift to have an extra-special new life to tend to this season, learning and doing what we can to help it thrive, waiting with wonder to enjoy the fruit of this growing process. Around the time that this blessed event got underway, I learned that Henry County High School would be hiring a new Spanish teacher for the 2010 school year. Emotionally, I was drawn to the idea of teaching, in the community where I live, a language and culture that has been very significant to my young adult life. 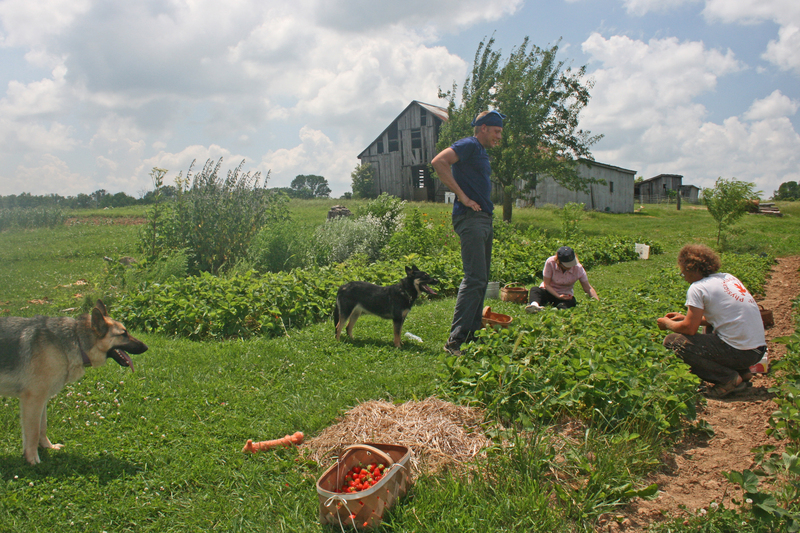 On the other hand, I rather enjoy daily life on the farm, working with and for some of the most excellent of people, producing healthy and healing food. I have grown a great deal personally from the challenges of this work, and have savored the vision of raising a family here with Carden, alongside the plants and animals. 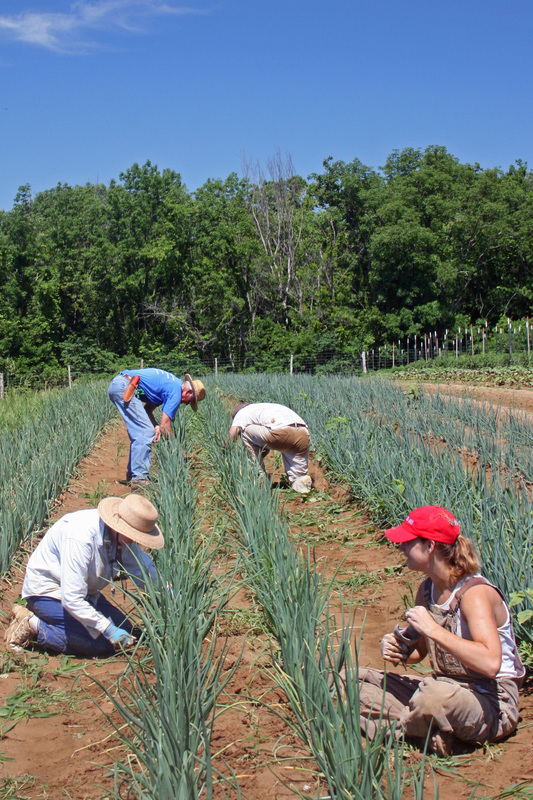 While the CSA income, with pretty careful budgeting comes close to providing for the needs of farm and farmers each year, we have relied on the generous and constant support of family, friends, and CSA members to keep this venture afloat these past five years. We have not wanted for much, but it is hard to deny the appeal of adding another income and affordable health insurance to this situation. After a month of mulling over the benefits and challenges of one of us working off the farm, we decided that it was worth applying for the teaching job. Of course, I have to be certified, so I also applied for programs at University of Louisville and Northern Kentucky University. A little over a week ago, Henry County’s principal called to offer me the job, which suddenly shifted into reality all of the circumstances that have rumbled about in possibility for the past several months. With a busy November in the plans, we’ve decided that the best option for teaching certification is the summer program offered at NKU…all day, all week, for seven weeks through June and July…followed by school starting in August… These last few weeks have been busy and bittersweet, as we try to do as much as we can before our team loses a member for the summer, and as we contemplate a new era in A Place on Earth CSA Farm life. But a new era it is, not an end, for the CSA show goes on. We have been working hard this month to get plants into the ground for the coming months, and the dry weather of the past week has allowed us to catch up with some of the weeding that had eluded us in the mud. Working share members will continue to lend indispensable hands in the harvest, and family and neighbors will provide harvest meals and company in my absence. And I will be home on weekends, eager to get into the dirt and to be reunited with my partner and my community. We hope you’ll join us on June 19 for our Summer Solstice potluck picnic, beginning at 3 pm. You are currently browsing the A Place on Earth Csa Blog blog archives for June, 2010.